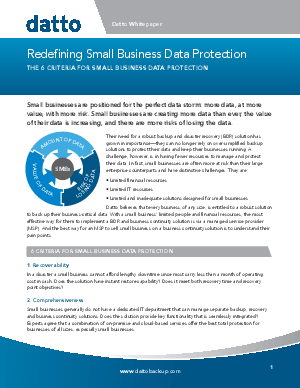 > Datto Inc. > Small business deserves a robust BDR solution. Now they have one. Small businesses are positioned for the perfect data storm: more data, at more value, with more risk. Their challenge has been not having an enterprise-class BDR solution built with their specific pain points in mind. Datto ALTO, and you, can change that.